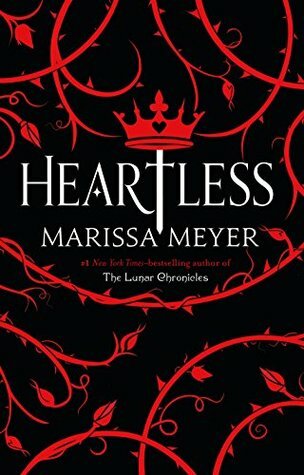 I have decided that I will read anything written by Marissa Meyer. I like her style, her voice, and her characters. They are complicated and imperfect yet likeable. And I absolutely adore the fact that she reimagines fairy tales - one of my favorite types of fiction. Catherine wants to be a baker. Catherine's mother wants her to be a queen. The King of Hearts can't think for himself (and because he enjoys her baking) so he has decided that he wants Catherine to be a queen too. But this is Wonderland, and things can be complicated, and strange, and very, very curious. Meyer tacked a retelling of Cinderella in her Lunar Chronicles series with Eastern influences, space ships, and a scary queen. This time we get an origin story for the Queen of Hearts, the "off with her head" happy monarch who, according to Meyer, has a very sad story. Sometimes you just connect to an author's take on storytelling. Sometimes you don't. I feel like I've come across the latter far to much lately. I also feel that this has something to do with a saturation of the YA book market and publishers trying to cash in quickly instead of putting effort into editing...but that conversation is for another day. Anywho, while the "complicated"ness of Wonderland includes a love triangle (of sorts), I liked Catherine. I cannot relate to her love of baking, but I appreciate her ambition and desire to pave her own way in life. Her fella of choice, the Jester, is whimsical and mysterious. Gotta love that. My one complaint is that their "romance" is a little rushed. The whole plot is a little rushed, to be honest. But it's a standalone, a fact I only discovered after finishing. A fact that broke my reading heart just a little. I wanted more. I wanted more understanding of the world and its oddness, the Hatter and his madness, and the Jester and his mysteriousness. Most of the characters you are familiar with from the original tale or Disney offerings is there. There is croquet and flamingos. There are tarts and hyper white rabbits. It's familiar yet new. And I adored it. If you are a fan of The Lunar Chronicles, you won't be disappointed in Meyer's new retelling. If you're a fan of retellings, you won't be disappointed in her version of Wonderland. And if you're just looking for something fun to read, this would be an excellent choice.